£32m project in Perry Barr and Witton will reduce flood risk for 1,400 properties. Environment Agency construction work gathers pace on the major flood scheme for Perry Barr and Witton, near Birmingham. The £32 million project will reduce flood risk for 1,400 properties currently at risk of flooding from the River Tame, including 950 homes. 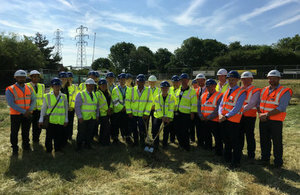 The Environment Agency carried out a sod-cutting ceremony to mark progression into the main construction of the second phase. The event was attended by Chair of the Environment Agency Emma Howard Boyd. The flood defence scheme has been developed in partnership with Birmingham City Council and Sandwell Metropolitan Borough Council. The partnership ensures that disruption to the park users is minimised and that the local community are kept informed through construction. The scheme, costing just over £32 million, is part of the Environment Agency’s programme of £2.6 billion investment into flood defences across the country. The scheme was made possible through funding contributions from Birmingham City Council, Regional Flood and Coastal Committee, Arts Council and crowd-funding. The formal start to the second phase of the scheme was coupled with a tour of the Perry Barr and Witton Flood Risk Management Scheme. This phase of the scheme, will provide additional flood storage at Forge Mill in Sandwell Valley, which is upstream of Perry Barr and Witton, and will control the flow of flood water downstream. Work in the Country Park will include new fencing for improved animal pens at Forge Mill Farm, extending it as a visitor attraction. There will also be improvements to the entrance into the park for pedestrians, cyclists and horse riders entering from the Old Newton Road. The main aspects of this phase include the building of the new embankment, installation of the river outlet and temporarily re-diverting the river. The first phase of the scheme was completed in spring 2017. Improvements were made to the existing upstream flood storage area at Perry Hall Playing Fields along with improvement works in Perry Barr and Witton, including wall repairs and wall raising along Brookvale Road, construction of walls along Tame Road and installation of a flood gate at the Atlas Industrial Estate entrance. These measures in isolation would not provide a big enough reduction in flood risk, so Phase 2 will provide the necessary flood water storage during a major flood, such as that experienced in 2007. It’s great to see first-hand work starting at Perry Barr and Witton – a fantastic scheme which not only proves the value of partnership working but which also promises to improve public spaces too. A keen cyclist myself, I’m pleased to see that as well as reducing flood risk the project will improve cycle paths and parkland in the area – a win-win for everyone. This excellent new scheme will better protect 1,400 more properties from flooding and will improve access to the wonderful Sandwell Valley Country Park for both local residents and tourists. With funding coming from the government, local councils, the Arts Council and crowd funders, this project is a great example of how by working together, we can help protect our communities and improve our environment. The scheme is due to complete in spring 2020. Along with flood defences and flood management schemes, knowing your flood risk is also important when protecting your family and property from flooding. People can check their risk and register to receive free flood warnings by visiting GOV.UK or calling Floodline on 0345 988 1188.